In this special compilation, you'll find a variety of Nigerian Sounds from the late 50's to the 80's and showcases some of the finest artists including Tony Allen, Orlando Julius and of course Fela Kuti. Mixing jazz, soul, rock, psychedelia and more with traditional African sounds and rhythms, the music that emanates from this fine collection is a testament to the rich, modern musical history of Nigeria. 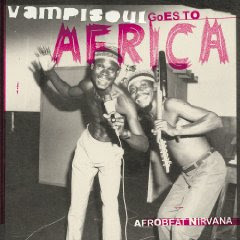 All of these songs come from current or upcoming releases on Vampi-Soul's huge West African Re-issue project but this CD, in itself, is a great introduction to the music that has come to be termed "Afrobeat". The full list of artists include Bola Johnson, Fela-Ransome Kuti, Opotopo, Tony Allen with Africa 70, Olando Julius & Afrosounders, Godwin Omobuwa, Fred Fisher Atolobor.